We offer privately owned and managed Beavers Bend Cabins with amazing mountain top views. Our cabins are fully furnished, offering everything from luxury bedding to wireless high speed internet. Our Broken Bow cabins are just minutes from Beavers Bend State Park and Broken Bow Lake, Oklahoma. McCurtain County features some of the most beautiful territory in the country. Beavers Bend State Park offers serious nature lovers the chance to hike along ridge tops, over creek bottoms, through tall stands of timber, and into remote areas. There are five nature tails and approximately 12 miles of hiking trails that are located in the portion of the Beavers Bend State Park that is below Broken Bow Spillway. For your safety, it is extremely important that before you begin a hike you first register at either the Forest Heritage Center or the Nature Center. Please make sure that someone knows which trail you are hiking and when you plan to return. Here are a few safety tips before heading out to one of the Beavers Bend hiking trails. 1. Always wear proper shoes or boots when hiking. When hiking the rocky trails of Beavers Bend State Park, sandals and cowboy boots are not recommended. 2. Allow approximately 30 minutes to 1 hour to hike for each mile of nature trail. The more challenging trails will require about 1 to 2 hours to hike for every mile. 3. If you plan on hiking on one of the more challenging trails, bring water, insect repellent and snacks with you. Bringing a hiking partner is also a good idea. 4. Avoid overexertion. Observe the difficulty levels assigned to each hiking trail. 5. Watch where you step. Snakes may be seen along the trails. Most of the snakes in the Beavers Bend State Park are not poisonous, but do not attempt to handle any snake. Snakes are most active in the late evening and at night. Be a courteous hiking trail user. Bag your trash and discard in proper receptacle. Please help keep the trails clean! Stay on designed hiking trails. Do not shortcut switchbacks. Shortcuts can become a source of soil erosion. Do not disturb wildlife. Do not pick wildflowers, wild grapes or vegetation along the trails. These are important source of food for the animals. Keep in mind that campfires are not allowed anywhere on these trails!!! South Park - Beavers Bend Creek: 1 mile; fairly easy to walk. Beavers Creek - Junction with South Park: 1 mile; easy to walk. Perfect for those who want a less intensive hike. Beavers Creek Crossing-highway 259A (Deer Crossing): About 1.5 miles; a bit more challenging, several steep climbs. Deer Crossing - Cedar Bluff: About 2 miles; some climbs, but not extremely steep. Cedar Bluff - Beaver Lodge Trail (Skyline Trail): About 6 miles; experienced hikers only. Challenging!!! Lots of climbs and steep grades, but the views you'll see will be well worth the climb. 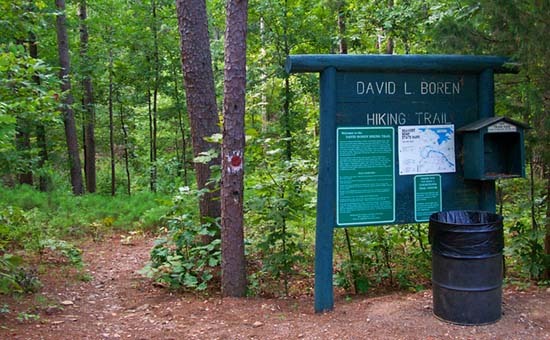 David Boren Hiking Trail: The southern 12 miles of the David Boren Hiking Trail run from the lower water dam at the south end of Beavers Bend to the Beaver Lodge Nature Trail that runs from the hydro-electric dam to the spillway. The trail was built from south to north. If you are walking the trail, please be aware of the fact that the hiking trail does NOT loop. Be prepare to walk the trail back or walk on the road back to your starting point. Keep in mind that The Forest Heritage Center has a map of all the trails within Beavers Bend State Park. Below are park contact numbers. We offer privately owned and managed Beavers Bend Cabins with amazing mountain top views. Our Broken Bow cabins are fully furnished, offering everything from luxury bedding to wireless high speed internet. Our cabins are just minutes from Beavers Bend State Park and Broken Bow Lake, Oklahoma. ©2012 Cabins in Beavers Bend. Watermark theme. Theme images by Jason Morrow. Powered by Blogger.